©1992 The Sales Curve Ltd.
Super SWIV is a vertical shooter by Sales Curve (aka SCI Games). A secret organization has stolen military weapons and machines across the globe, and they have now regrouped and are ready to strike. The player is sent to infiltrate the enemy's base to destroy it from the inside, and annihilate their power core. Two vehicles can be controlled (or paired in the two simultaneous player mode) to eliminate the threat and possibly save the world. The Jeep can fire in any directions but can become obstructed by ground obstacles. The vehicle can however jump over objects and gaps giving it a chance to maneuver its way though storms of bullets and hazards. The Helicopter is a lot more straight forward and can only fire ahead, but it features a contemptuous air superiority. Four weapons are available throughout the game and can be selected at any time as long as they were previously picked up - they are usually hidden inside large metallic crates and spread out in the air when cracked open. They range from fast missiles, flamethrower, laser beam and spread gun. Other items such as the protective force-field can also be collected along the way. The original game, simply called S.W.I.V, was originally released for the Amiga (1991) and ported to other home systems at the time such as the Atari ST (1991), Amstrad CPC (1991), ZX Spectrum (1991), Commodore 64 (1991). 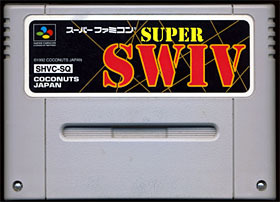 Several conversions are also worth mentioning : Super SWIV (Super Famicom, 1992) aka Firepower 2000 in the US, Mega SWIV (Megadrive, 1994), SWIV (PC Computers, 1996) and SWIV (Game Boy Color, 2001). 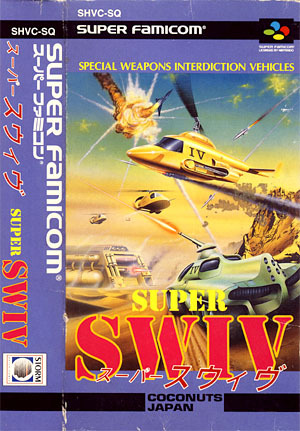 S.W.I.V is supposed to stand for Silk Worm IV (it is also known as Special Weapon Interdiction Vehicles or the unlikely Silk Worm In Vertical) and is a 'spiritual' sequel to Tecmo's arcade shooter called Silkworm originally released in 1988. However, S.W.I.V is somewhat more a sequel to The Sales Curve's home conversions of Silkworm originally released for the Amiga (1989), Atari ST (1989), Amstrad CPC (1989), Commodore 64 (1989), ZX Spectrum (1989) and Nintendo's NES (1990). Imagine if all the mega weapons in the world fell into the wrong hands. And then were turned against you. That's time for major firepower. You've got to take the wheel of a jumping, whirling, gun-heavy jeep that fires in any direction. Or master the controls of a deadly fast, missile- loaded helicopter. Both war machines have special capabilities. Both change into different vehicles on certain levels. It's up to you to pick the right weapon. So get ready to collect your flamethrowers, plasma cannons, lasers, guided missiles, nuclear weapons and more. There's no time to assemble forces - it's just you or you and a partner going straight into the blazing, blasting heart of enemy territory. Make sure you buckle up. And put your finger on firepower. Choose between a Helicopter Gunship or an Armoured Jeep and prepare to enter enemy territory as part of the elite assault team of SPECIAL WEAPONS INTERDICTION VEHICLES. Battle against enemy'copters, tanks, hovercraft, snowmobiles, mechanised flying fish, giant weapons installations and much more in this vertically scrolling shoot'em up. But beware, the enemy is armed with the latest deadly weaponry, including the lethal SILWORM IV homing missile. Add your Pov here ! Super SWIV features one of the best examples of a game redefining Dual Gameplay in its own terms. The game delivers some solid co-op action - the two vehicles have to work together and protect each other backs in order to survive. So what about the solo game in all of this ? As expected, this is the only draw back, and single-game can be a real challenge. Graphics are nice and detailed with some unique and unusual enemy designs spread nicely around the levels. I only wish bosses were a bit more along these lines, they often end up being long and boring moments you want to fast forward and get over with. Music tracks are also rather weak and do not really fit the game, unlike the beautifully crafted sound effects. Finally, I wonder why this Super Famicom conversion lost the 'continuous loading' featured in other versions (here the game is split into stages and stops after each boss). All in all, for all Super SWIV's high production values, there are some annoying short comings. But the game is nevertheless an excellent vertical shooter. This title is up there, a game among the best SNES vertical shooters in my book, which is an extremely rare feat for a non-Japanese developer.